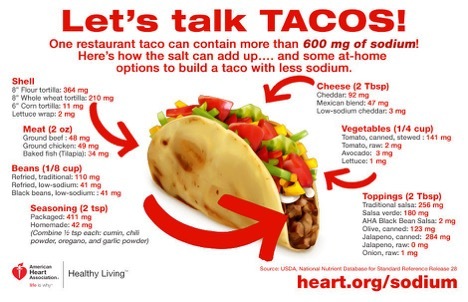 Wellness Wednesday Tip #44: Taco Talk! Preparing for Cinco de Mayo! With Cinco de Mayo this week, we thought it’d be timely to do a post on how to make healthy food choices for the holiday. If you’re anything like us, you LOVE tacos! 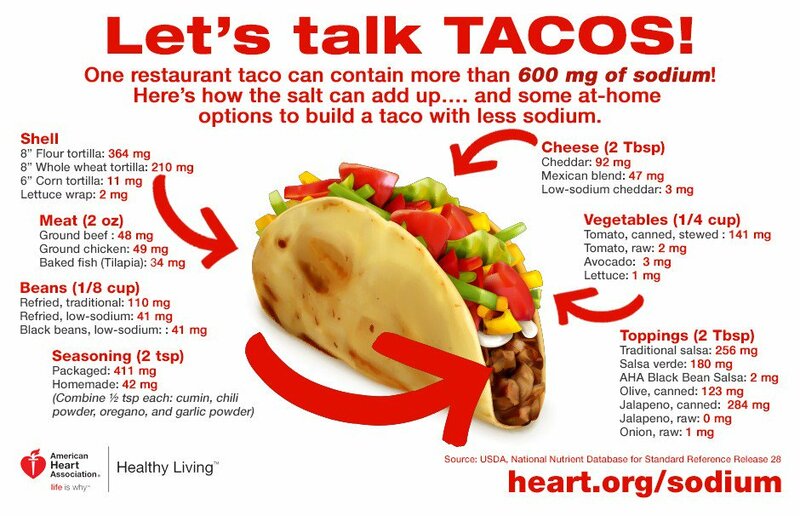 Here’s some tips to take your taco to the next level in terms of health. a. Soft > Hard: Hard shells are typically fried which adds excess fats and calories to the taco. b. Corn > Flour: Corn tortillas have few calories, fat, and sodium than their flour counterparts. They are also higher in fiber. a. This is what makes tacos awesome. There’s an infinite amount fillings to add to your taco to always spice things up. b. If you choose meat, I recommend a leaner meat such as chicken rather than red meat such as pork, beef, or steak. Chicken has less unhealthy fat and cholesterol than the latter options. c. Fish can also make a great substitute. I recommend baked fish to avoid excess saturated fat from frying fish in oil. e. Toppings: If you’re like me, then you’ll agree, the spicy the better. Salsa makes a great topping for lots of dishes, especially tacos. Salsa is also a great way to add more vegetables to your dish. Guacamole can also add great taste with healthy fats and a creamy texture. Sorry this bonus doesn’t involve money, but it will certainly taste better. Given the soon approaching holiday, Aaron decided to share his favorite salsa recipe with you all to try out. Do you have a favorite taco or salsa recipe? Let us know! We’d love to try it. ¡Feliz Cinco De Mayo! Thanks again for all of the #WellfieWednesday support, be sure to post your pictures this week and tag the WW crew members (@PBernerSPT, @Eric_in_AmERICa, @AaronPerezPT, @fitnerdaimee, @DianaKlatt) and keep the wave of healthy change going!